The winner in a boxing match is often the competitor with the fastest punching speed. How quickly you can deliver a punch increases your chances of landing it and improves the force behind it. While punching speed is partly dependent on genetics, anyone can make significant improvements with consistent training. Regularly incorporate these five exercises into your training regimen. Always warm up with jump rope or jogging before you begin. Shadowboxing involves practicing a variety of punches in the air. It helps you improve your neuromuscular coordination, allowing your neural system to send faster signals to your arms. Work on each punch, including the left jab, right cross, left hook, overhand right, left uppercut and right uppercut. Move on to combinations, such as a left jab followed by a left hook, or a left uppercut, right uppercut and right cross combo. Focus on the technique and speed of each punch. Training on a speed bag increases punching speed while improving hand-eye coordination and muscular endurance in the shoulders and arms. Throw short, compact punches with the bag hanging about the height of your mouth. Focus on keeping the bag going back and forth in a rhythmic manner. Increase your punching speed as you improve your coordination. 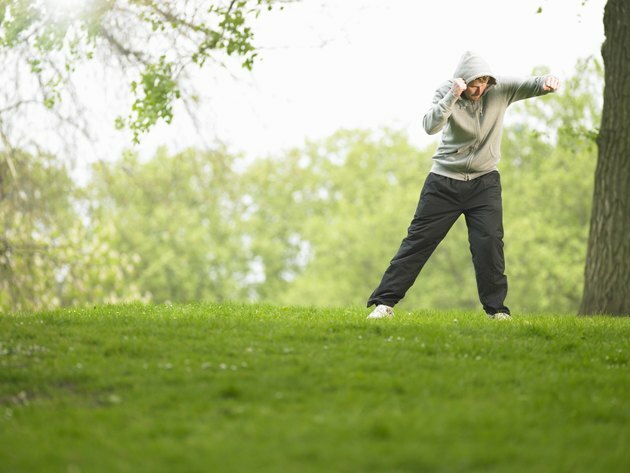 As you become fatigued, your punching speed will subsequently decrease. You can build up endurance in your arms and shoulders with punch intervals. Have a partner hold a punching bag steady. Punch the bag non-stop for 15 to 20 seconds. After you finish, have your partner go while you hold the bag. Once your partner is finished, jump into the drill again. Continue until you and your partner have completed a total of three minutes. Complete two to three sets of three minutes each. Rest 60 seconds in between each set. Explosive pushups will help develop power in your chest, shoulders and triceps, the major muscles in the upper body involved in punching. Plyo pushups are similar to regular pushups, except that instead of maintaining a steady cadence, you lower down to the floor at a regular speed and then explode up off the floor. You should produce enough power to launch your upper body off the floor. Land with your hands ready to immediately go into the next rep. As you improve, incorporate a clap while your upper body is off the floor. Complete three to five sets of five to 10-reps.